“Lost In Japan” is a good song about a very cute situation. Shawn Mendes is a pop star who's made a name for himself playing the guitar and singing sad songs about getting his heart ripped out of his chest. On hits like "Stitches," "Mercy," and his new single "In My Blood," he effectively plays the role of sad troubadour and it's a very believable act. But on "Lost In Japan," the second track from his third album, he strikes a new pose, one that is nicer, in my opinion — he's a romantic boy with a good plan. On the lite-R&B song, he sings about being stuck somewhere that's one quick flight away from Japan, where his friend/lover is without him. Over a bright little bass groove, he shyly asks if he should get on the plane. It's cute! 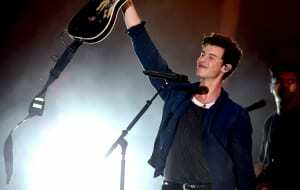 In 2016, Mendes told The FADER that John Mayer is his musical idol and on "Lost In Japan," the singer manages to channel all the best parts of a John Mayer song. It's a short and sweet love song that leaves you a little starry-eyed when you're least expecting it.